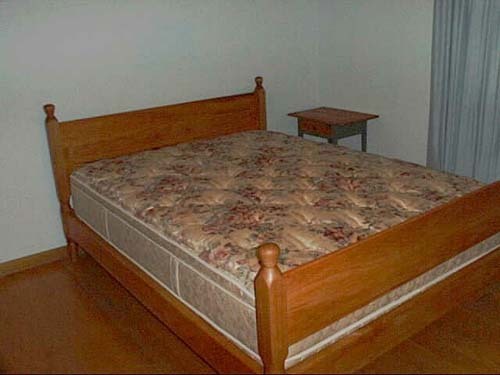 This bed was a high-priority project and happened immediately after acquisition of sufficient equipment and construction of a usable workbench. Up until it was completed I was sleeping on a bed left behind by the previous owners of the house and it was wrecking my back. Materials for the panels in the head and footboards are Tennessee cherry which is marked by promient pitch pockets which generally make it undesirable in the open market. I find them interesting as long as they are not too prominent. The posts and rails are made of Pennsylvania cherry which I hauled down from Lancaster. This is rated as some of the best cherry available. The bedposts are turned in a simple form with few curves and a single bead near the foot. The posts are joined to the fixed rails with mortise-and-tenon joints and to the removable rails by heavy metal hook hardware which is mortised into the components. The bed has no box spring installed because the oversized mattress is so thick on its own that any more elevation might induce nosebleeds. The finish is tung oil and wax.